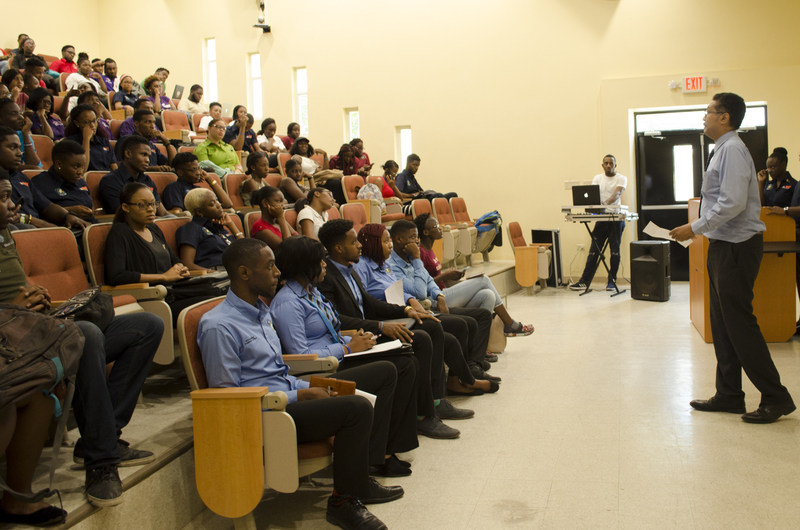 President of the University of Technology, Jamaica, Professor Stephen Vasciannie speaks with students of the university at a mass meeting hosted by the Students’ Union on Thursday September 20 2018. President of the University of Technology, Jamaica, Professor Stephen Vasciannie addressed concerns voiced by students of the university at a mass meeting hosted by the Students’ Union recently. Professor Vasciannie, who was guest speaker at the event used the opportunity to answer questions and address concerns put forward by the student body. Among the issues raised were accreditation, student loans, admissions staff, water issue at the School of Public Health, the $20,000 increase in fees for the School of Hospitality and Tourism Management and the “sick-out” of university teachers. One concern that stood out was voiced by student Glendon Martin who asked, “Why should the system be trusted when students have been evaluating lecturers for years and nothing has been done?” This question raised many eyebrows, especially when he passionately added that a lecturer who had an alarmingly high failure rate was promoted. Professor Vasciannie stated that he did not want to personalize the situation and that meetings are held to discuss evaluations made by students about teachers. Glendon Martin poses a question to Professor Stephen Vasciannie, President of the University of Technology, Jamaica, at a mass meeting hosted by the Students’ Union on Thursday September 20 2018. 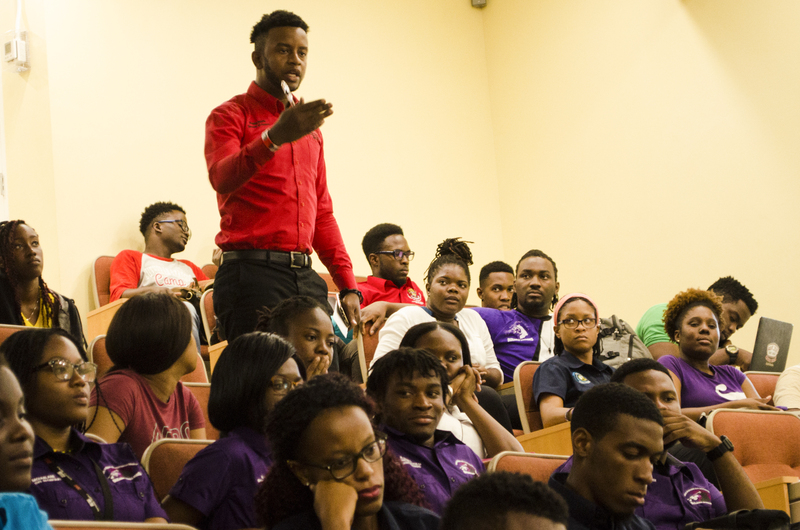 Even with these issues being the discussed, the meeting took a positive turn when Professor Vasciannie stated improvements that were made in various areas of the university. Students were impressed when told that identification cards would now be valid for their tenure and that any business they have with Student Services would be easier conducted. Professor Vasciannie was then commended by a student for the many positive changes that he has seen while attending the university. 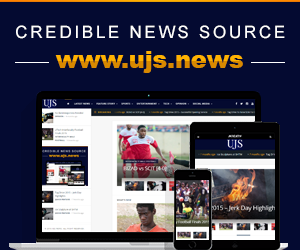 In addition, the student asserted that he was fond of the school and that he and his friends personally believe that UTech Jamaica will and can only improve in many areas. There was a full house of applause and laughter especially when Professor Vasciannie interjected to ask who paid him for his sentiments. The meeting concluded with the various Students’ Union representatives presenting their portfolios and what they had in store for future endeavors. Members representing the union were Tia Ferguson, President of the Students’ Union, Kahlil Hutchinson, 1st VP Academic Affairs, Nicholas Gordon, VP Students’ Services, and Patrick Pinnock, VP Public Relations. The Union states that they continue to put all their efforts into improving student life and representing their colleagues as best as possible.